The contest has concluded. I’ll determine winners and contact the lucky recipients over the next week, and once everything’s locked, I’ll announce the results. Sign up for my way-less-than-monthly newsletter if you’d like to receive announcements of upcoming contests and events. All of us run a contest on our own sites. Each contest might be a little different from the others. What they have in common is that we’ll each give away two books. Then we’ll donate a third book to the collective grand prize, so someone who enters any of the various contests wins a signed book from every writer involved. You can enter each contest only once, but you can enter as many different contests as you like. To enter here, simply reply to this post with the title of your favorite—or your first—fantasy, SF, or horror novel not written by me (to cross out flattery as a tactic). If you’ll elaborate on why that novel is your favorite, or how it drew you into the genre, that’s fantastic but not required to be eligible for the random draw. But if you do elaborate, you gain a second chance to win. I’ll pick one winner by random draw and a second based on which commentary most persuades, amuses, or delights me. If by chance you have all of these novels, we can work out a substitute from my remaining author copies of other works. To be eligible, you must make your post between now and March 19, 2014. I’ll post the prizes soon after receiving mailing information from the winners. Please also visit the sites of the other participating authors. I don’t know all of them well, but those I do are terrific writers and wonderful people. Enter their contests, read their work, and check out all their majesty. 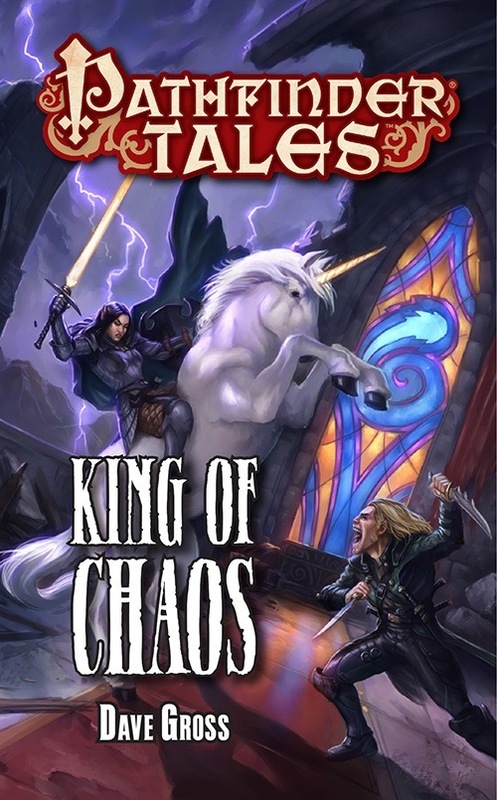 This entry was posted in Movies and tagged King of Chaos, Master of Devils, Prince of Wolves, Queen of Thorns by Dave Gross. Bookmark the permalink. I think my first full length fantasy novel was the Hobbit, although I fell in love with the genre early enough it’s hard to say, and there are such mixed lines there (I read a lot of borderline urban fantasy/horror before my time). I remember enjoying the delightful sense of adventure in the book, as well as the way the world felt lived in. It definitely made me hungry for more. My first fantasy novel was The Hobbit, by J.R.R Tolkien. I was seven years old when my father suddenly took out this book out of his impressive fantasy and sci-fi books collection, and gave it to me, telling me I would probably like it. I think he’s never been so right in his whole life. I loved it so much that I took the habit of reading it every automn, for many years from this moment. I liked how adorable was Bilbo, how he evolved during his adventure, and all my taste for fantasy tabletop role-playing games and the genre in general comes from the magic Tolkien was able to instill in almost every word he wrote, So while I have many favorite fantasy novels, this one still holds a special place in my life. The Hobbit is probably the book most responsible for my tilting away from SF and diving deep into fantasy for my teenage years. My first fantasy book was “Lord Foul’s Bane” by Stephen R. Donaldson. I was introduced to it by a high school friend when I was going through one of those rough patches in life. It really help me to escape!! I’ve loved fantasy ever since!!! I will go with the first fantasy novel I read (that I remember). I came across the first three Dragonlance novels in a combined edition back in the late 1980s. I had not read any fantasy before that and was given them by a friend. I was sucked in immediately (junior high concentration on a new thing is great), and I have become an avid fantasy reader since. I still go back and reread those three books every couple of years, and I started reading them out loud to my kids once they were old enough. I have played Dragonlance campaigns in D&D 3.5 as well. I don’t read much Dragonlance anymore (I’m currently very into the Forgotten Realms), but I have a great fondness for the world and series. I have some awfully fond memories of Dragonlance, too. If you come across my Realms novels, I hope you’ll post a note with your reaction to them. Boy’s Life by Robert McCammon was super important to me as a young adult and quickly became on of my favorite books. That there were others out there like me obsessed with reading and comics and monsters meant a lot to me as someone in a small southern town. It is the first book that I buy someone when I find that they are like minded. My first fantasy book was “A Spell for Chameleon” by Piers Anthony. I was so intrigued by the idea of a world where magic was so common that if you didn’t have some type of magic you were exiled from Xanth and force to go to Mundane (which looks a lot like Florida). The creatures, the spells, the wizard in his castle of tests – I loved every part of this book. It is still one of my favorite books to date and always the first book I recommend to new fantasy readers. Yes, I became addicted to Piers Anthony. My first was Tolkien, but it was Terry Brook’s Sword of Shannara that made me realize that fantasy was a genre and Tolkien wasn’t a lone, freak genius. My first Fantasy novels was the Hobbit and The Lord of the Rings which I read before and during 3rd Grade. As I reread them to my daughter, they remain my favorites as one of the few stories I don’t mind rereading. My first fantasy novel was The Neverending Story by Michael Ende. One of my fondest childhood memories is of my father reading me this book, which I absolutely adored. When I grew up a bit, I read it by myself and I found it just as compelling and amazing as I did when it had been read to me. Now, many years later, I still consider it one of the best fantasy novels ever written and the novel I keep going back to whenever I identify myself as a fantasy reader in a group of people. More than anything, it was the book that taught me how to employ my own imagination and craft my own stories and for that, I think, I will eternally be grateful to it. My introduction to the fantasy genre was The Icewind Dale Trilogy omnibus by R.A. Salvatore. I remember the state I was in (Florida), the store I bought it from (Bookland, back corner), and several settings in which I enjoyed it in. I was never interested in reading until I picked this up; it literally changed my life. I read “A Wizard of Earthsea” by Ursula K. Le Guin when I was 10 years old as my first self-read fantasy. I don’t recall being aware – at that age – that there existed a genre called fantasy at all – but this trilogy (originally a trilogy) still to me is some of the best fantasy ever written. My stepfather did read both the Hobbit and the Lord of the Rings as night stories when I was younger but of those I differ very much in opinion from the many others who like them: I only fancy the Hobbit – I actually find the Lord of the Rings boring (I know, it’s close to blasphemy, sorry). My first fantasy novel was the hobbit it was required reading for a 7th grade speed reading class and my gateway to reading as a pastime. My favorite Is Deadhouse Gates, from Steven Erickson’s the Malazan Book of the Fallen. I really enjoy books that bring out emotion, any emotion, and Deadhouse Gates is full of emotion. So much so, I would even dream about the plot and characters. The self sacrifice the characters endure really resonates with me and is why it is my favorite! Legend by David Gemmel was the first. It set my 13 yr old mind alight with the quick action and great commentary on heroric fantasy. I still go back to read that book 20 years later and I am thankful everyday that is set me on the path of amazing worlds and adventure. I read the Hobbit the summer before I started kindergarten and I was hooked. I had to re-read it several more times over the next few years before I fully understood all of it and by 4-5th grade I was digging on the Lord of the Rings. Sounds like a fantastic contest, thanks! I have to say that Patrick Rothfuss or Brandon Sanderson are both authors that have marked my recent life, I arrived this blog after I made myself a fan of pathfinder as many of us here. And being an apprentice to what great authors imprint in their book, translating that into actual roleplay and making a everyone have a better experience is the dream of every sentence I record in my head. Though I live in Mexico, in a country where insecurity still plays a large part of how you live your everyday books have gave me the opportunity to escape into world of fantasy that make me dream of a better tomorrow. The book which has branded me with a whole new vision is The Name of the Wind, from Pat because even after everything is lost there is hope and a fate waiting to be discovered. This is like choosing a favorite child. I have to say that Goodkind’s “Wizard’s First Rule” sticks in my head. Believe it or not, it wasn’t the hero of the story that has stayed with me, but his amazing character Kahlan Amnel that win me over…..but wait! I like the works of Melanie Rawn as well! Dang you Dave! Scions of Shannara. Whole not my favorite out of the many books in that world, it’s the first major fantasy book I can recall reading, and it opened up the whole genre for me. You remind me of the initial release of The Sword of Shannara with those beautiful Hildebrandt illustrations. I still hold George RR Martins first book Game of Thrones as my favorite. The way Martin twists your expectations of ” the hero always wins the day” and turns it on it’s head, will stick with me forever. I also like how Martin creates sympathy for some of the bad guys by giving you a little back story of the character and how they got to where they are. I’ve no idea what my very first fantasy book was – I slowly dripped into it from a very young age, including Hobbit, Girl with the Silver eyes, Asterix books, and even some of the more paranormal Three Investigators, and eventually on to Piers and McCaffrey. My first gaming novel though I remember bright and clear, and it remains one of my favorites – The Legend of Huma. I knew nothing about Dragonlance, and was dropped into the deepest myth of the entire setting, but it started with a very personal story of a very real character. I feared for him, I cheered for him, and I wept for him by the end. I remember fondly the first Fantasy genre book I ever read. I was in high school and a friend of mine told me to check out Terry Brooks’ Sword of Shannara. I started reading the book on a Friday night and didn’t put it down or go to sleep until the next afternoon, yes I read all 726 pages barely stopping as I devoured it from front to back. It was the coolest thing I had ever read up to that point and got me really interested in the fantasy genre. Now it’s all I read and what I write about. First or favorite fantasy / Sci Fi / etc novel eh? Wow. For me, I am going to go with Andre Norton’s Star Rangers. This fits BOTH categories you are looking for. It really was the FIRST genre novel I ever read. I believe I was 8 or 9 years old when I found this at my local library. I had no idea what this kind of book was, but, the picture of the rocket on the cover was cool. 40 years later, I am STILL reading Fantasy / Sci fi (and some horror as well). Star Rangers had it all for me: ALIENS! SPACEMEN! ROCKETS! GUNS! And, a very cool ending. Best part? I had no idea Andre was a female and didn’t find out until much later. This is not a shock today, but, for 40 years ago, it sure was. So, you could say she opened my eyes and mind to science fiction and gender issues as well. I too became a fan of Andre Norton quite young and before discovering she was a woman. I think she was the one who opened my eyes to the common practice of adopting a male or androgynous pen name to slip into the boy’s club. the first book to get me into fantasy (read: not star wars) was R.A.Salvatore’s The Demon Awakens. don’t know why, something about the cover art, and description and premise really appealed to me. My favorite fantasy novel is, by far, “The Lies of Locke Lamora” by Scott Lynch; it is simply one of the finest pieces of writing I’ve had the pleasure of reading in any genre. Scott has a way of carrying a reader into his fictional world that few others have. The setting is highly detailed, while avoiding the tedium that elaborate description can sometimes bring. The writing is clever, the plot is thoroughly engrossing, and the banter between characters is some of the most enjoyable and funny you can ever read. So yes… read it. And the sequels. Both of them. NOW. My first fantasy fiction book that I really loved was David Eddings: Pawn of Prophesy. I loved it. I really looked forward to the “quiet time” at school which is when for 30 mins after the lunch break the teacher had us read quietly (to unwind us from lunchtime). My first novel (ever!) was Dealing with Dragons by Patricia C. Wrede. It remains a favorite, well written engaging characters, fun story, and good sequels. It introduced me to fantasy novels and the idea that books without pictures were awesome, hehe! I can’t say for sure if it’s actually my favorite, because it’s such a difficult question to answer, but I love Stranger in a Strange Land for a LOT of reasons. For one thing, I’ve never read anything else quite like it, and uniqueness in science fiction is pretty great. I also love the idea of the Witnesses. I think they were a really interesting concept, and seeing them in action was really cool. As someone who thinks a lot (often about inane things, but a lot nonetheless :P), it is pretty foreign to me to turn the extrapolating part of the brain off and focus on nothing but what you can actually see directly in front of you. There are a lot of other reasons, but I think that’s a pretty good one. The Name of the Wind, by Patrick Rothfuss (and the sequel). Looking forward to the third installment, as well. My first fantasy experience was “The Book of Three” by Lloyd Alexander, chronicling the travails of Taran, Assistant Pig-Keeper and the Oracle Pig, Hen-Wen. The novel is the first installment in the Prydain Circle and introduced the reader to the rich world of Welsh mythology from the Mabinogian. The characters of the harsh mentor Dallben, Coll the swordmaster, Gwydion the aloof grey wolf, the princess Eilonwy, Fflewddur Fflam the befuddled bard, the dark lord Arawn, the Master of the Hunt – The Horned King, and the delightful Gurgi are unforgettable and archetypal figures that contribute to a classic work of fantastic literature. My father gave this to me when I was in elementary school and I shared it with my autistic son, demonstrating its cross-generational appeal and the timeless qualities that distinguish Alexander’s mythical work as a watermark for writers of the genre. My favorite fantasy novel is–just barely–The Anvil of the World by Kage Baker, who managed to create a marvelous universe in which the lead character is definitely not someone we’re necessarily meant to identify with, but who is nonetheless engaging, and through whom we see the world with very tired eyes. I’m pretty sure the first fantasy I read was The Phantom Tollbooth in grade school. The first I read on my own was The Hobbit. But the first that really made an impact and cemented my love of fantasy was the DragonLance Chronicles trilogy. I really fell in love with the genre withies books. They led me to the Icewind Dale trilogy and many, many other fantasy books. I recently reread (and I rarely reread) Dragons of Autumn Twilight and I was happy it still holds up after all these years. The Hobbit, JRR Tolkien (of course). I first read it as a child, and then had the great pleasure of reading it to my own children, who loved it. I’ve decided to make this simple for myself and go with my first and favourite Sci-Fi novel (I’m hoping trilogies count, even those in five parts, if they’ve been collected in one volume), as my fantasy list is far bigger. A large reason for it being both my first and favourite is the sheer amount and quality of the humour inherent in this book. While I can’t say definitively that it was my first in the genre, it’s the first that I can remember. Since then I can attribute at least some of the reason for looking to the stars and the future in books, not just to other fantastic worlds through magic, at its feet. I likely would have focused some of my attention that way eventually considering how much I used to read when young, but I couldn’t have asked for a better introduction to the genre. I hope you don’t mind if I name a few more titles, not for the entry but just because I’d half written this reply with each of these in mind before thinking of Hitchhiker’s. These being Wool (the Silo Series) by Hugh Howey, and The Diamond Age by Neal Stephenson, both of which have been new favourites for me recently, and have drawn a bit more scifi into my reading list. The fantasy novel that got me hooked on the genre was The Halls of Stormweather. I was traveling for work (Army civilian) out at Fort Irwin for two weeks, and my teammates and I went to a mall, and I wondered into the bookstore to get something to read. I was looking over the fantasy section, and saw The Halls of Stormweather. It looked like an interesting book, and said it was a great introductory piece. Most of all though, it was a collection of short stories, and I absolutely love short stories. So I picked it up, read it, and started my love of all things Fantasy. My original copy will never leave my bookshelf no matter what books I rotate in and out, maybe one day it will be an heirloom. Thanks for posting, Graham. Could I get you to post another comment mentioning a book to which I have not contributed? You’ll save me from accusations of favoritism if yours is the name I draw. I’m an American who grew up in the states and has rarely left them, My grampy (my mom’s dad) used to tell me fairy tales and stories from his days in Ireland. At first they were the classic Aesop’s Fables lighthearted and educational kind of stories, and then as I grew he told me fey stories far more grim than what most people know. Stories of baby snatching and bogeymen, and court intrigues that would make your head spin sideways. It was no far leap for me to then pick up reading that followed similar veins of thought. Juliet Marillier’s Daughter of the Forest takes place in Ireland just as Christianity is finding its way there from the British Isles. Somewhere around the late 300’s early 400’s. Ireland, then known as Erin, still follows older faiths. Faiths we would call paganism or, perhaps, a type of druidism. The main character is a girl named Sorcha. She is the seventh child and only daughter of the Lord of Sevenwaters, a kingdom known for its wise and compassionate rule. A witch curses Sorcha’s brothers and turns them into swans, and to lift the curse Sorcha must weave six shirts made of sharp nettles without speaking a word until the last shirt is done. Things get even more complicated when, upon nearly drowning in a river, she is rescued and eventually falls in love with her rescuer and marries him. The ending is tragically happy and I won’t spoil it, so everyone here should read it. The reason why I love this book, and every other book I’ve read by Marillier, is because of the way she presents her fantasy elements and how the people interact with them. Fey creatures and their magics show up quite a few times throughout this book and others, and it is always subtle, fleeting, whimsical, but never wholly innocent. That is -exactly- how it should be. Any story involving fey, in my opinion, should be written in a style that portrays the fey, and then embodies them. Marillier did this through use of visitations, subtle changes in the world, and poetic ironies that simultaneously sadden the heart but gladden the soul. What’s a story about fairies without a little whimsy? The messages the book attempted to deliver was rather heavy-handed in many regards. They still rung true, though I wish she’d been able to apply the level of nuance she did with world building and character development to her rhetoric. Overall the book portrayed a complete and believable world with realistic character development and enough fantasy to sate my appetite. I do not think that I can honestly pick an all time favorite novel because it changes depending on where my life currently is at the time the question is asked. 🙂 Right now, it would actually be The Adversary by Erin M Evans. However there are two novels that started me down the path of fantasy novels as my prefered staple of reading indulgence. The first was Stranger in a Strange Land by Heinlein. It was given to me by a friend who said it changed his life. Before I read it, I had not read anything ever like it and it opened a new window into new worlds that I did not even know existed. The other novel was Mists of Avalon by Bradley. This novel first entranced me into a world of magic, and from there I was hooked. Star of Gypsies by Silverberg. I’m going to have to give my fantasy love to Brent Weeks’ Night Angel Trilogy…I know we were told to choose A book but there’s no way you could only read the first and not keep truckin. The Horus Heresy books from Black Library has me hooked too…so much good SciFi/fantasy out there. The first book of Fantasy I remember is “The weird of the White Wolf” by Mickael Moorcock. This contest look like an english homework for me, as I’m french. I was born in past seventies, and discovered Fantasy in eighties. First you need to know in France Fantasy is not consiterate as a real writing style, we found books in science fiction row in stores. Translations were very strange and sometimes strangly censored by translators who didn’t know nothing about Fantasy universes… It’s been only a few years that we find some good translations. Only Howard, Tolkien and Moorcock could be found easily with good translations, so there were my first read in Fantasy, and the very first was “Elric le Necromacien” with four short stories of the White Wolf (The Dream of Earl Aubec, The dreaming city, While the gods laugh and The singing citadel). This book has changed my life, and Fantasy is now one of the most important thing in my life, with my beloved wife and our pets. Sory for my poor english and thanks for your contest ! I would have to say it was DragonLance that really sucked me in. I had read the Hobbit, Lloyd Alexander, some Piers Anthony and a few others. But there was so much about DL to love. The great Elmore art, the game material to learn about the world and history, and the strong characters of the story both good and bad. It just opened my eyes and imagination to getting lost in that world a little bit at a time. The Bartimaeus Trilogy! It was absolutely incredible and has modern day wizards summoning demons in order to keep control of the government. Political intrigue and magic galore. I found Dragons of Autumn Twilight in the Jr. High library when looking for a book to do a report on. I was hooked instantly. 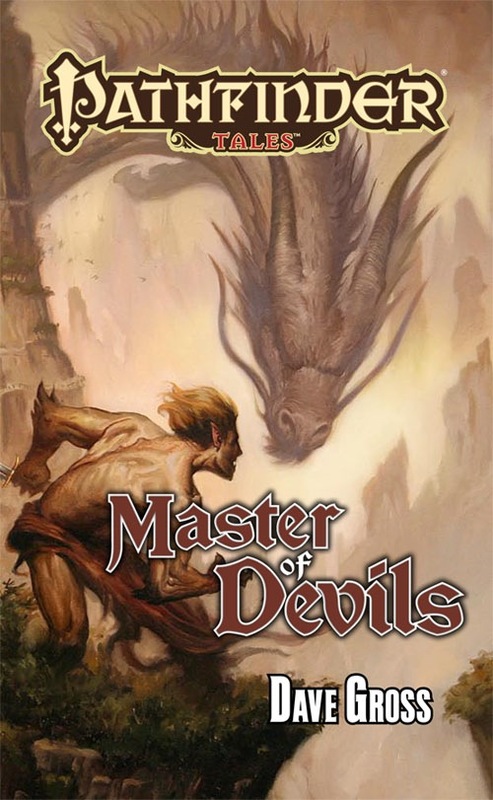 I had played a little Dungeons and Dragons before, but I never knew there were books about it. After that, 90% of my allowance went to buying Dragonlance and Forgotten Realms novels. Now that I have two kids of my own, both of whom love role playing games, I can’t wait until they get to have the same experience I did with their own Pathfinder tie-in novels. Tricky one. I’d have to go with Nine Princes in Amber by Roger Zelazny though. Fantastic author in general, blurs genre lines left and right, has a much more poetic approach to prose than most genre authors. Nine Princes is probably the starting point with his body of work though. 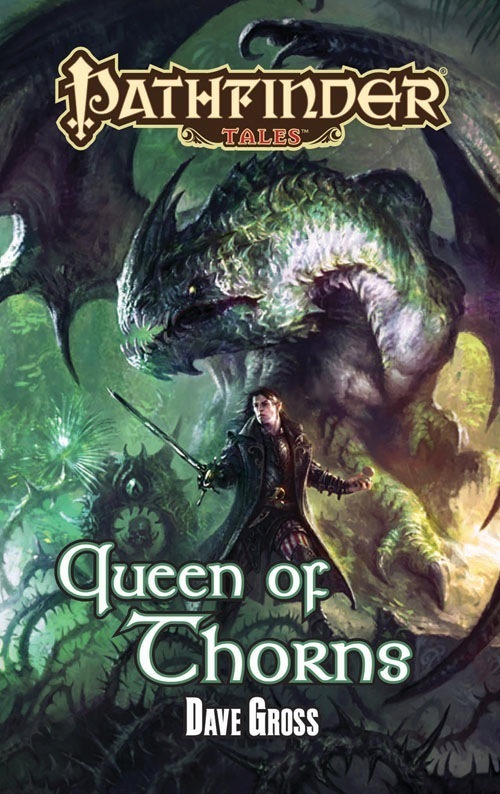 Fairly grounded, kicks off his big obligatory fantasy series, and said obligatory series manages to wrap up with about the same total page count some authors hit with just a single entry of their big ol’ epics. That’s a hrd one as I love so many books, but I guess my current favorite is American Gods by Neil Gaiman because his writing and imagination hooked me from the first page. “The NeverEnding Story”, by Michael Ende (original title: Die unendliche Geschichte). I will go with my first as it really is hard to pick a favorite. The first book I read that led me to many other fantasy books such as “The Hobbit”, and then most prominently the Dragonlance books of Weis and Hickman, was “The Black Cauldron” by Lloyd Alexander. I was young when I read it and much like the children of this generation grew up with Harry Potter (or Ron or Hermoine) as their hero, I was taken by the young farm boy who, with his unlikely group of friends, fought against powerful forces. Since that book, high fantasy has been my go-to genre. Books and stories that pull me out of the real world and into places where anything is possible. My first fantasy book that hooked me in the genre was The Hobbit by JRR Tolkien. I was about 12 years old and had just moved to Guam (we were a military family) and didn’t know anyone. I had always been a reader, it always occupied the time traveling when we moved. I was instantly engrossed by Tolkien’s style of writing and could envision everything he was describing in it. It’s what started me on my road to playing Dungeons and Dragons and reading more fantasy novels, which I still do to this day over 30 years later. My first Fantasy novel was “The Crystal Shard” by Salvatore. I was a Freshman in HS and a junior I looked up to handed it to me. Little did I know that, much like the artifact in the book, the book itself had a corrupting influence, changing me into the enormous nerd that I am today. My first was Dragons of Autumn Twilight by Margaret Weis and Tracy Hickman. The first “real” book I read was Stephen King’s Cujo. I was 11 and I cried at the end. Not because the the kid died but because Cujo DIED!!!!! IT WASN’T HIS FAULT THAT HE HAD RABIES!!!!!!! I think the first fantasy series I read would be Xanth by Piers Anthony. I think I started it because there were already a ton available, and I hated running out of things to read. They were much better fantasy back in the day, instead of packed with puns and adult content that’s not adult these days. But they sure were funny. One of my favourite fantasy novels of all time is Raymond E. Feist’s Magician (the full big book, not the separate editions). I discovered it quite randomly when I was still experimenting with the genre back in 2001/2002 and it has become a classic. And I’ve read almost all the novels that have followed over the years. The first book I can clearly remember reading that was either sci fi or fantasy was Dragonflight by Anne McCaffrey. I’ve always loved dragons and the way she built her world around Lessa, F’lar, and the rest of Pern has always stuck in my head. I really enjoyed the sword of shannara as a child because of the story of two brothers. Has to be Legend by David Gemmell, the king of heroic fantasy. I don’t think I could choose a favorite, but my first was Darkwalker on Moonshae. The first fantasy novel that I’ve read (that I can remember at any rate) is The Blue Sword by Robin McKinley. I was nine at the time and I don’t recall what exactly drew me at the time. I do however think I will go dig it back out and read it again. I’ll determine my two winners today and pass along all entries for the grand prize. Thanks to everyone who participated. We’ll have to do something like this again in a few months. If you’d like a reminder when another contest rolls along, please sign up for my way-less-than-monthly newsletter.